Apple on Sunday released a new Apple Music ad spot featuring Drake getting pumped —literally and metaphorically —to Taylor Swift's "Bad Blood," a meta callback to Swift's own commercial for the streaming music service. 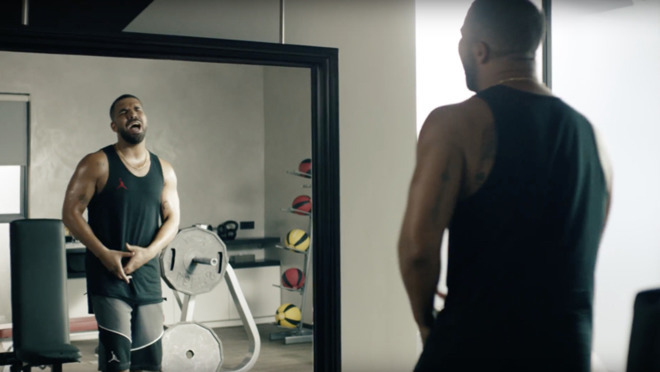 The minute-long commercial opens in a gym with Drake —listening to Frank Ocean —finishing up a set of shoulder presses, spotted by a muscular member of his posse. Both are expectedly hyped October's Very Own completed what appears to be a strenuous arms day. Before walking out to take a call on his iPhone, Drake's friend says, "No mercy." Drake echoes the rallying cry. Today's commercial can be considered the sister of an Apple Music spot released in April. One of the first of Apple's TV spots to feature a big-name music act, that ad showed Swift running on —and ultimately falling off —a treadmill while singing to Drake's "Jumpman." It, too, ended with the tagline "Distractingly Good."